I do not believe in fads. I avoid anything the media wants to sell as a must-have for any season, or the must-eat vegetable or spice for this or that year. Since we laid out the garden at Towerwater, I have always planted the reliable old varieties of vegetables. However, heirloom vegetables have provided an opportunity to ‘play’ with the garden. I might decide to colour my vegetable garden with white beets, white carrots, white brinjals and white pumpkins. Or, I could plant purple carrots, purple tomatoes, purple beans and purple cauliflowers. Heirloom seeds bring magic into the garden. From the excitement of choosing the seeds, to planning and planting them. Then watching the plants grow and seeing the first flowers, the fruit or roots. After waiting a whole season, the harvest allows for a feast of colours on the plate. Being on social media exposes one to so much information. 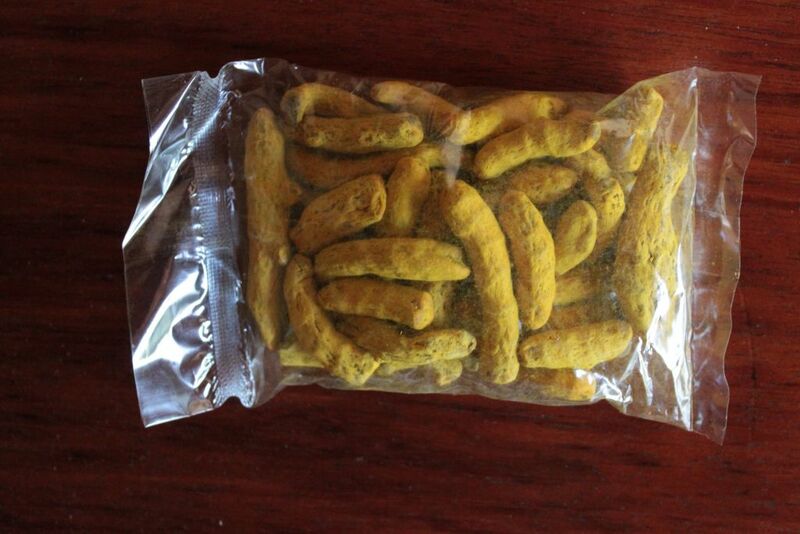 When I saw the first few ‘shares’ about turmeric, I did not take much notice. 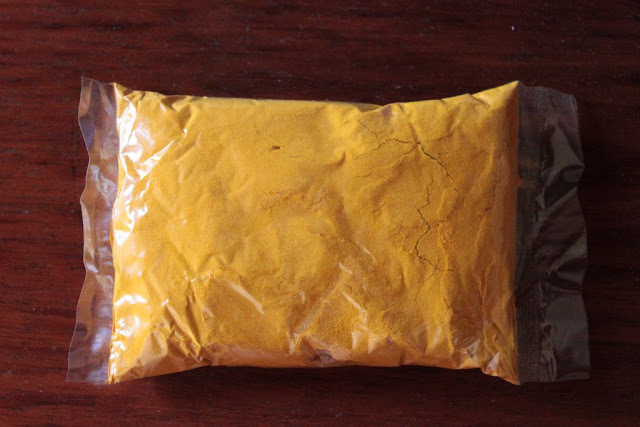 However, when one of the nurseries that I buy heirloom seeds from, sent me an email to inform me that they have stock of turmeric rhizomes, I thought I should have a more serious look at this spice. The next day I went online to look at the nursery’s stock and was informed that all the turmeric was sold out. I was puzzled. Not even 24 hours earlier they had sent me an email to inform me that they had received new stock. Okay, I had to admit my interest was piqued. As with anything in my life, I started a voyage of discovery to ascertain the truth behind the buzz words. I discovered that turmeric has always been a highly valued spice in Asia. It has been used in medicines, cosmetics, as a dyeing agent and for culinary purposes. Traditionally, no Cape kitchen would have been without dried turmeric root or ground turmeric. One of the most popular traditional dishes in the Cape is Bobotie and yellow rice or “begrafnis rys” (literally, “funeral rice”); so called, because it was traditionally a favourite dish to serve at funerals. Both components are prepared using turmeric. At last I managed to get hold of eight turmeric rhizomes and planted them in the herb garden. On Saturday I saw a tiny leaf, like that of a ginger plant, struggling its way through the mass of self-sown borage seedlings. 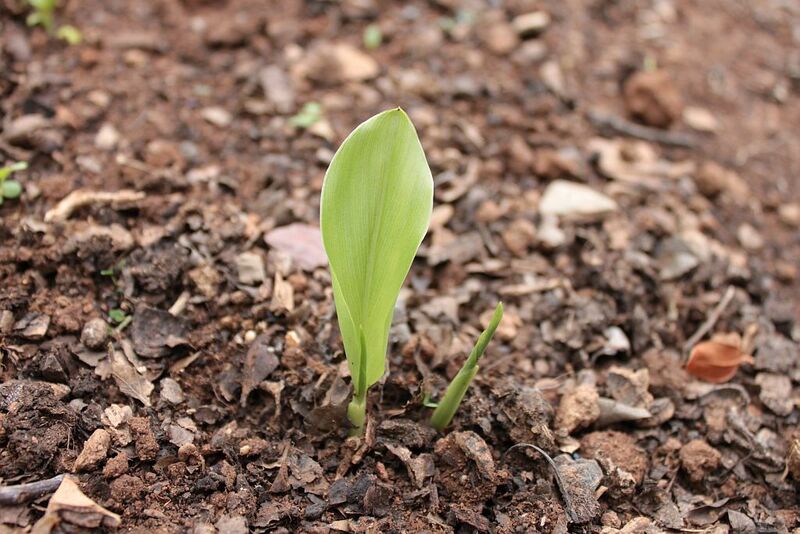 On closer inspection, I discovered that it was the first turmeric plant with four more buds pushing through the soil. I am excited to see how the plants and especially the flowers will look. 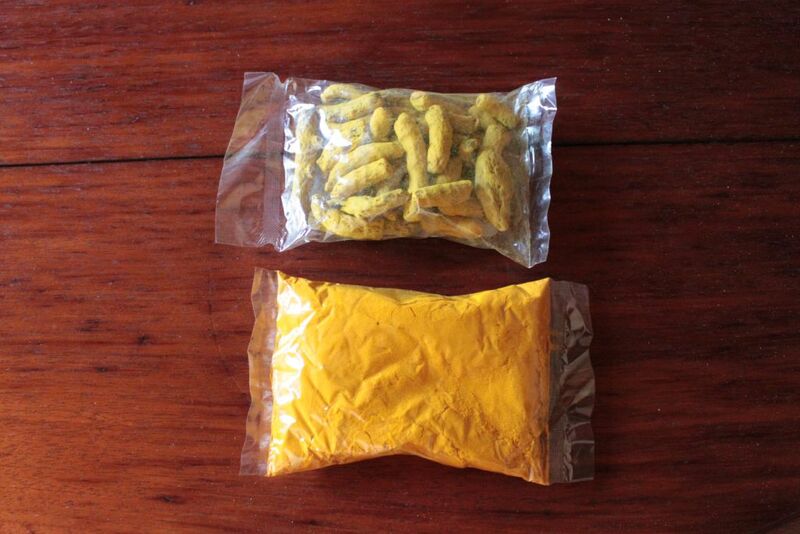 I have never tasted fresh turmeric and look forward to experimenting with this spice, both in food and drink. Firstly, I will have to do a lot more reading to find out how accurate the assertions are about turmeric being used to reduce arthritis symptoms, inflammatory skin conditions, gingivitis, and possibly even preventing colon cancer and Alzheimer’s disease. 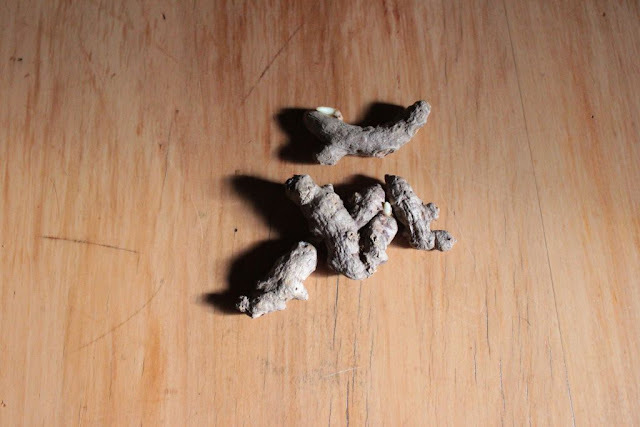 Traditionally it has been used in Ayurvedic and Chinese medicine to treat infections, liver and skin disorders. 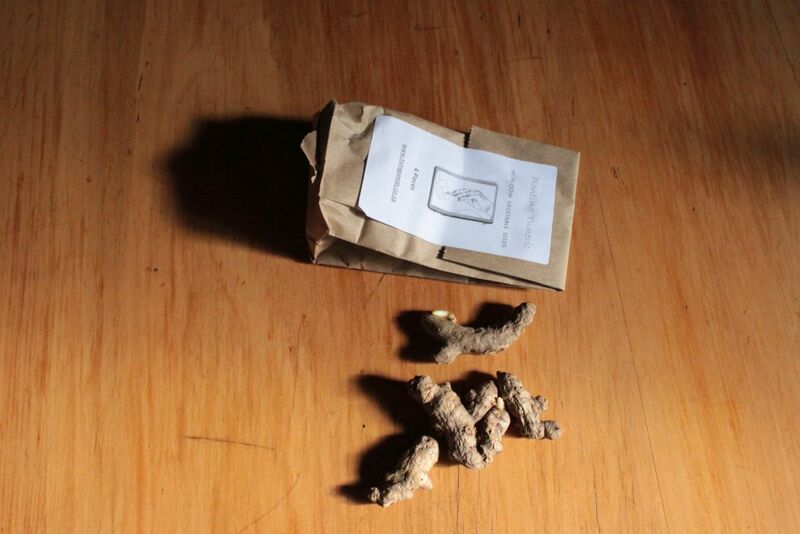 It has also been used to dress wounds and burns and to decrease inflammation. The time has come to explore the properties of this miracle spice in all its forms at Towerwater. I'm very eager to read more about your tumeric adventures. It's a must in my home. I use it in my curries and yellow rice.